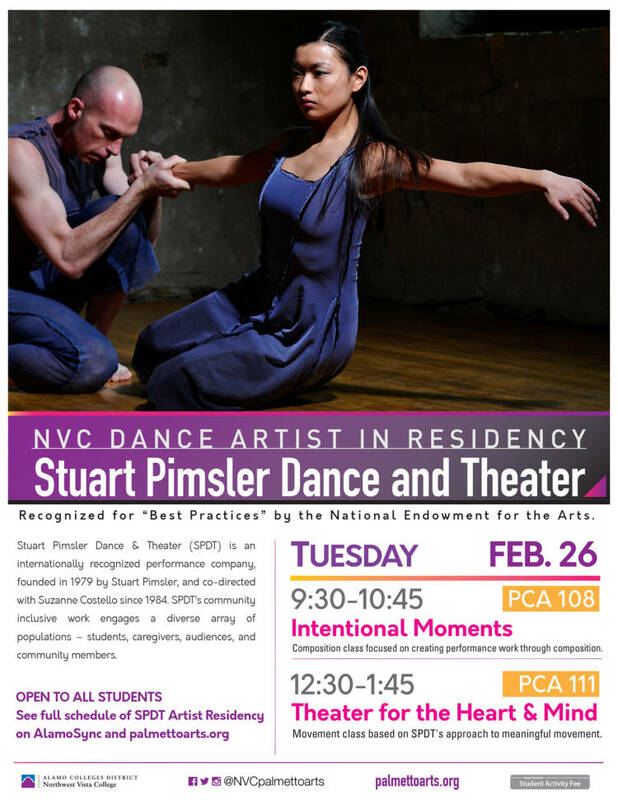 Northwest Vista College’s Dance program will welcome Stuart Pimsler Dance & Theater later this month – an internationally recognized company that engages communities through their performance work, as well as diverse educational programs including arts and health. Even though SPDT will be on campus for a week, two events that the community may want to check out start on Wednesday, Feb. 27. The “Theater for the Heart & Mind” class on Feb. 27 is based on SPDT’s approach to meaningful movement from 9:30 am to 10:45 am. On the same day from 11 am to 12:30 pm, SPDT will present their “Tours of Duty” workshop for veterans. Participants are invited to share their stories of military service, including active deployment and returning home. Through group sharing and gentle movement exercises, they find new ways to communicate their life experiences so that they may be heard, honored, and celebrated. SPDT’s interdisciplinary vision weaves movement, spoken text, song, and visual imagery that comments on the personal and political. Its company artists have been distinguished for their artistic excellence, garnering numerous fellowships from the National Endowment for the Arts, McKnight Foundation, and five Minnesota SAGE Awards for Dance.